Ich heiße Franz. Danke Herr Schwarz. Ich bin spät dran. A nice and simple, basic German conversation. Unfortunately, for those that don't know any German, this conversation is simply 100% memorization and no context, making no use of the Germanic knowledge already in their head. Most textbooks sold in bookstores also fail to make use of this knowledge. 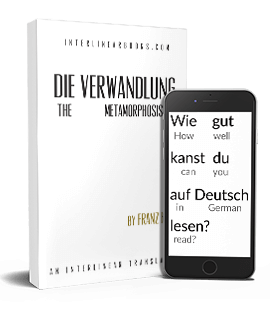 An ideal introduction to German for students that may not necessarily want to pursue the language later on should focus almost entirely on English and German cognates. Affe - ape. Hint: ff in German often corresponds to English p.
Wasser - water. Hint: tt in German often corresponds to English t.
Geboren - born. Hint: if a word starts with ge-, remove the prefix and then see if you recognize the word. Now the word becomes Boren, much closer to English born. dass - that. Hint: d often corresponds to English th, and as we learned above, ss to English t. The student would also learn the letter ß, which is like a double s (dass used to be written daß). ei - sounds like English "eye". Now mein can be sounded out as "mine", instead of something sounding more like "main". Students now might be able to recognize a word like dein as being cognate with English thine. unmöglich (impossible) - a bit harder than the rest, but if the students are taught that -lich corresponds to English -ly, and mög to might, they can now see that this word literally means "unmightly", thus impossible. Buch - book. -ch in German often corresponds to English k. Machen - make/do. There are dozens and dozens more of these, and are all alike in that they make good use of the Germanic knowledge English students already have simply by having a Germanic language as a mother tongue. In this way vocabulary can be learned much more quickly than simply learning word after word without context. This method only works with Germanic languages though, since those languages split off into their respective languages at a more recent date than other Indo-European languages, and so simply understanding their orthography and the systematic ways in which they differ is enough to give students a great deal of passive understanding. French, on the other hand, has bequeathed English a great deal of loanwords in more recent times and thus these words are much more recognizable, while at the same time basic words are less so. The best part about this idea is that it doesn't necessarily need to be taught in a language class either; it can simply be done so as part of the history of the English language. Recognizing Germanic roots can be done while learning about Old English, and in a later unit the students can learn about the influence on English after the Norman Invasion when French loanwords began to make their way into English. After these units are completed the students should also be able to tell whether they happen to have a particular liking for Germanic or Romance languages, which will also help them to make better decisions on what language to choose in the future. I completely agree, since it's a method we both used for the learning of many other languages. But most teachers and pupills are so narrow-minded... Sometimes I think this method could be applied to sambahsa and IE languages, even Parsi. Yes ! Parsi "kh" = IE "sw". Parsi "a" = IE "e" and Parsi "d" = IE "t"